Through the design center, we offer well over 150 different professional / university level creative and fine art classes together with a range of fun, creative experiences for kids. We are also a CPDU provider for Illinois teachers wishing to acquire credits toward certificate renewal. We also offer specialized technique classes taught by nationally known instructors. 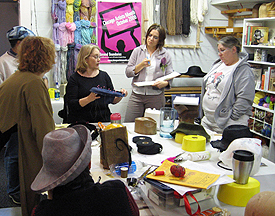 Past Classes have included: Millinery (Hat making) Classes with Jan Wutkowski of North Carolina and Eia of Chicago, Paper Casting with Barbara Fletcher of Massachusetts, Color & Imagery in Felt making with Patricia Spark of Oregon, PMC advanced techniques with Hattie Sanderson of Illinois, Polymer Galaxy Beads with Jennifer Bezingue of Illinois and Felt Hat making Classes with Chad Alice Hagen, author of "Fabulous Felt Hats" from North Carolina. Our instructors strive to address the needs of entry level students, as well as, students with advanced level proficiency skills. We hope to offer a nurturing, inspiring....fun environment for all students. In additional to the above, we also offer a collection of activities for Girl Scout Troops. Groups of children or adults may select from our general list of classes and schedule a private "party" session complete with kitchen access for food and drink. CLICK HERE TO VIEW OUR DETAILED ART SUPPLY LISTS. Felted Silk Scarf Kits now available. Click Here. Want to take a Felt Scarf workshop with Tammy? Click Here.